REGINA, Sask. - The No. 4-ranked University of Regina Rams improved to 4-1 on the season and improved their winning streak to four games with a 37-29 win over visiting Saskatchewan Saturday in Canada West action. The game was the first to be played at the new Mosaic Stadium, with the announced crowd of 16,500 setting a new Canada West attendance record in any sport. The Rams avenge their only loss of the season with the win, as they suffered a two-point overtime loss in Week 1 to the Huskies in Saskatoon. Rams quarterback Noah Picton completed 29 of his 42 passes for 370 yards and four touchdowns, throwing two majors apiece to Mitchell Picton and Ryan Schienbein. Schienbein finished as the game’s top receiver with career highs in both receptions (13) and receiving yards (189), while Picton had seven catches for 85 yards. Atlee Simon had his best game of the year for the Rams, finishing with a game-high 114 rushing yards on 23 carries. Nicholas Dheilly led the Rams with 7.5 tackles and also brought down Saskatchewan quarterback Kyle Siemens once to pull into sole possession of the Canada West lead with four sacks on the season. Danny Nesbitt had a pair of interceptions to become the first Rams player with multiple picks in a game since Kirby Kezama in the 2012 Hardy Cup game, while Jeff Propp added his second interception of the year. 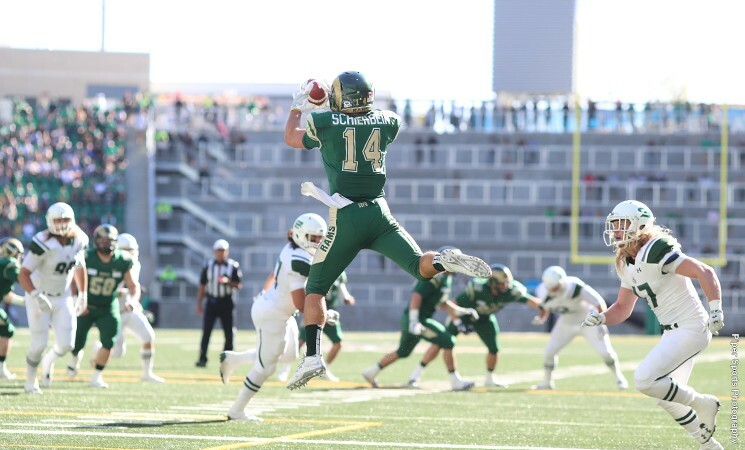 Siemens was 23-for-43 for Saskatchewan (2-3) and finished with 265 passing yards including a five-yard touchdown to Colton Klassen in the first quarter. Tyler Chow had 17 carries for 63 yards and a pair of majors, while Chad Braun had four catches for a team-leading 83 yards. With the Canada West bye week upcoming, both teams will return to action two weekends from now. Saskatchewan will host UBC (3-2) on Oct. 14, while the Rams will hit the road for a matchup with Alberta (0-5). NOTES: Noah Picton moved past Mark Anderson for second place on the school’s all-time list in touchdown passes … Picton has 39 career passing touchdowns but has some work remaining to catch former Rams pivot Teale Orban, who holds the Canada West record with 76 … Picton also joins Orban and Marc Mueller as the only Rams ever to collect at least 6000 career passing yards … Mitchell Picton now needs only two touchdown receptions to tie Jason Clermont’s school record of 11 set during the 2001 season. Watching the highly entertaining game in the new Mosaic, the feeling I had is analogous to someone who has lived in an old house in an old neighbourhood in North Regina their whole life and now wins the Home Lottery and ends up in a big new house in Wascana View. It felt weird, but great. Great showcase for CIS football, hard hitting with lots of intensity. The stadium is impressive and is something the City,Province and fans can be proud of. Once the concessions,video screen and remaining work is complete the game day experience will be that much better. True enough Old Hank, but the new 'Wascana View' home is still located in North Central. Can the city confirm over 10 break ins to stadium in 2016 by young offenders?